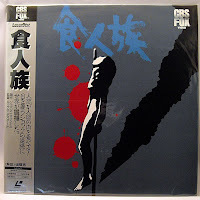 A Japan-based eBayer is selling off a slew of excellent condition laserdiscs right now, see his listings here. I'm out on these as I'm paranoid about ordering LDs overseas, but if one is braver, there's a ton of jewels for the taking. The crown of the bunch happens to be a CBS/FOX LD of Ruggero Deodato's Cannibal Holocaust (currently @ $83 with 3 hours to go). Along with the VHS edition, this is still the "holy grail" of this film's legitimate home video releases due to their rarity. I've nabbed the photos for reference purposes as these are the clearest shots I've ever come across (back/insert/disc here). Good luck to those who bid! It's a beauty! Terrific to see this getting some attention. I have this LD and will never sell it.